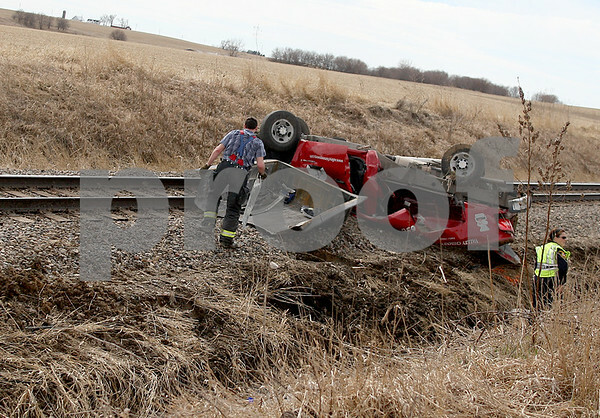 Firefighters and the Sheriff's Deptartment attend to the scene of a truck rollover onto train tracks near Rt. 30 in unincorporated Waterman, west of Pine St. and east of Leland Rd. on Monday, March 30, 2015. The rollover occurred around 1:09 p.m. after a Hinckley Police Officer attempted to stop the allegedly stolen Chevy 2500 HD truck for dropping items on the train tracks in Hinckley. The driver increased the truck's speed — instead of stopping — and rolled the truck onto the train tracks in Waterman. The DeKalb County Coroner pronounced the driver dead at the scene. The Hinckley Police Officer that followed the driver was taken to Kishwaukee Hospital for stress-related symptoms.